Warner and DC Entertainment have announced Gotham City Impostors’ release has been moved to February. 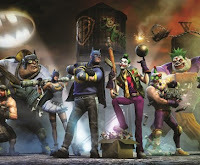 The game is a download-only FPS allows for up to 12 players to battle it out for control over an “unhinged” Gotham City overrun by DC Comics-inspired impostors. It was originally going to be released this month on PC, PSN, and XBLA.